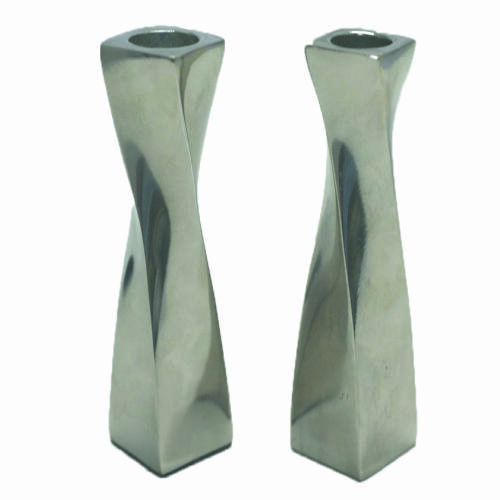 This pair of stunning Shabbat candlesticks is a beautiful modern pair of Judaica candle holders that are made in a twisted design, out of aluminum, in a stylish and luxury look. Truly delightful, these unique twist design Shabbat candlesticks are Judaica items that fit into the home decor of modern homes as well as traditional decor styles. Made of aluminum for convenience, they are stylish and well made. A wonderful wedding or anniversary gift, they are a wonderful way to usher in the Sabbath. 16cm tall, they are elegant in shape and elegant in design. They are easy to clean and sparkle wonderfully in the candlelight.